Safe Kids Grand Forks is a region-wide coalition whose mission is to prevent unintentional injuries and death to children and youth 19 years of age and younger. Safe Kids has built a vast coalition of health care providers, government and community agencies, schools, churches, businesses and individuals that work together in a collaborative nature to keep the children of our region safe from their number one cause of death - unintentional injury. Our efforts are multi-faceted and comprehensive in order to maximize the number of children and families we reach with our injury prevention message and to assure that they are effective. We base the development and implementation of programs on the five E's of injury prevention - education, encouragement, engineering, enforcement, and evaluation. Click here for a summary of ways to connect with Safe Kids Grand Forks. Safe Kids Grand Forks is always eager to accept new members in our Coalition. If an individual, business, agency or service group has an interest in injury prevention and childhood safety, Safe Kids would love to have you as a Coalition member. There is no fee to join the Coalition and yet there are benefits you will receive by being a member. Any help or expertise you can share is greatly appreciated. Safe Kids Grand Forks meets as a full Coalition once a month for most months during the year. Meetings are held routinely at Altru Clinic in East Grand Forks (607 DeMers Ave) on the third Thursday of each month, from 12:00 - 1:00 p.m. Lunch is served so an RSVP is appreciated (safekids@altru.org). Meeting notices and agendas are sent out in advance and members are also kept updated with meeting minutes, newsletters and emails. Anyone with agenda item requests should submit them to the Coordinator 2 weeks in advance. These subcommittees are also open to new members. For more information, contact the Safe Kids Grand Forks Coordinator. If you or your organization/business is interested in serving as a volunteer at any of our coalition events, please contact the Coalition Coordinator for more details on how your help can be used. We are always in need of eager volunteers. Safe Kids Grand Forks operates almost entirely from grant funding and donations from individuals. All donations made to the Coalition are spent on safety devices and injury prevention programs. Administrative costs for the Coalition are provided by the lead agency, Altru Health System. Please help us keep kids safe - even a small donation will make a difference. Your donation in any amount is appreciated and will be used in the risk areas of greatest need unless otherwise specified by the donor. Thanks for your donation and support of our injury prevention efforts. We are set up as a 501(c)3 corporation so your contributions are considered a charitable donation. If you are interested in providing a donation of products (i.e. car seats, bike helmets, smoke alarms, etc. ), please contact Carma Hanson, Coalition Coordinator to make arrangements. Donations such as these are always welcome. If you are interested in donating your time to Safe Kids, please contact the Coordinator and your talents will be matched with the Coalition's many volunteer needs. We always have needs to fill for teens through adult aged helpers. Some activities include interactions at events, while others include "behind the scenes" prep work. We will match your skills to a volunteer project! Thank you in advance for any help you can offer toward the goal of preventing childhood injuries. For more information on being an event or program sponsor, contact the Coalition with your request. Safe Kids Grand Forks is pleased to boast four National G.M. Buckle-Up Awards bestowed on our Coalition, our local Buckle-Up program partner and two faithful volunteers. At the 2002 National Leadership Conference in Washington, D.C. Judy Larson, Safe Kids Grand Forks volunteer was awarded one of three National Buckle-Up Volunteer of the Year Awards. Judy has played a part in saving children's lives through car seat programs for many years and we are pround to have her a part of our Coalition. Photo above: Carma Hanson, Safe Kids Grand Forks Coordinator, with Kate Carr, President and CEO of Safe Kids Worldwide and Judy Larson, who received a National Buckle-Up Volunteer of the Year Award. 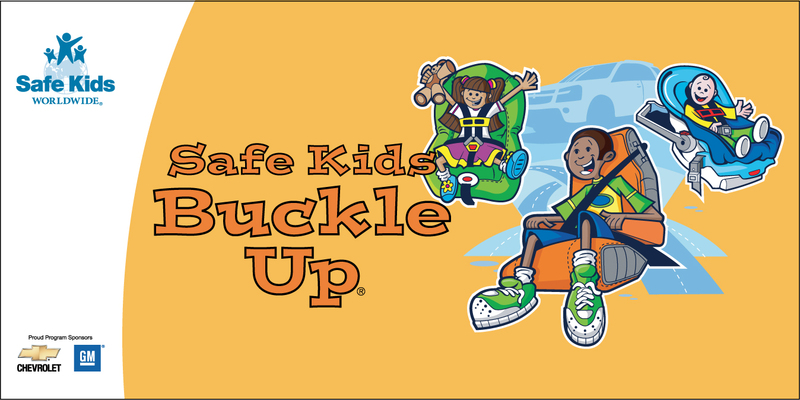 Safe Kids Grand Forks and Rydell Auto Center, our local partner for our Buckle-Up Events, were awarded the prestigious 2002 National G.M. Dealership/Coalition Partnership Award. We are very proud of this award and know that this wonderful partnership is helping the children of our community to ride safer, thereby preventing injuries and death. Photo Above: Torine Creppy, Safe Kids Worldwide Chief Program Officer with Wes and Brian Rydell. In 2004, Bill Vasicek, a long time volunteer of Safe Kids Grand Forks, also received the National Buckle-Up Volunteer of the Year award for his countless contributions to keeping children safe in and around vehicles. Bill received his award at the 2004 National Safe Kids Leadership Conference in Washington, DC. Photo above: Bill Vasicek assisting at a car seat check-up. In 2005, Safe Kids Grand Forks again was recognized for their efforts in the child passenger safety arena with the 2005 Outstanding Achievement in Public Policy award. This was given to recognize the work done by the Coalition to pass the booster seat law during the 2005 legislative session. Photo above: Carma Hanson, Safe Kids Grand Forks Coordinator with Dr. C. Everett Koop, former US Surgeon General (right) and Dr. Marty Eichelberger, Founder of Safe Kids Worldwide. Safe Kids Grand Forks won the 2011 Community Engagement Award. The Community Partner Award is given out to an agency that interacts and connects UND students to the Grand Forks community. For many years, Safe Kids Grand Forks has partnered with the UND College of Nursing to provide educational and clinical experiences for these students. "Kids in the region are safer because of the work of Safe Kids Grand Forks, under the direction of Carma Hanson. This coalition of many community partners is dedicated to reducing childhood injuries. Importantly, the program provides many UND students service learning opportunities that help new generations of professionals become GREAT professionals. These students will go on to keep kids safer in their own communities in to the future." Photo Above: Safe Kids Grand Forks Coordinator Carma Hanson with UND's First Lady Marcia Kelly (4th from left) and Safe Kids Grand Forks Coalition Members. In February 2011, Safe Kids Grand Forks Coordinator, Carma Hanson, was inducted into the North Dakota Traffic Hall of Fame. This recognition was given out at the annual Law Enforcement Summit by the North Dakota Department of Transportation. She was recognized for her coalition’s work in traffic safety initiatives in the Grand Forks region and across the state. Recognition was noted in the areas of child passenger safety initiatives including car seat check-up events and classes for parents, caregivers, law enforcement, health care providers and the region at large. Special note was also given to our work in the areas of local and statewide texting laws and booster seat laws. Photo Above: Safe Kids Grand Forks Coordinator Carma Hanson with Mark Nelson, NDDOT Safety Director, and Linda Butts, NDDOT Deputy Director for Driver and Vehicle Services. In April 2013, Safe Kids Coordinator Carma Hanson was awarded the National Water Safety Congress Award of Merit for her work in coordinating the annual Kids Don't Float water safety classes held annually in Grand Forks. Each year, over 500 children and 100 adults are trained in a two hour water safety class. Since the class was started in 1997, nearly 10,000 adults and children have participated. During the award presentation Hanson noted, "While this award is being bestowed upon me, it really is a reflection of the collaboration and many partnerships that take place to conduct these classes each year. Without these partnerships and numerous volunteers, we would not be successful in our efforts. Water safety is a lifelong skill and we are thrilled that Safe Kids Grand Forks can facilitate the efforts to teach the young children of our region and community strategies that will keep them safe their entire life."